Antonio's favorite uncle Pedro arrives to take them to El Puerto, the home of the Lunas. El Puerto is only ten miles from Guadalupe, but it is the only trip the family ever takes. Ultima goes with them this time. María gets very excited when they reach her hometown, but everyone is off farming. They stop first at her father's house, the largest in the village. The smallness of Antonio's world is emphasized by the short distance to El Puerto. The character of the Lunas is expanded here and María's attachment to their fundamentally ordered way of life. Antonio's grandfather is named Prudencio. María greets him excitedly and then Ultima hugs him like an old friend. They discuss the boys away at war, and Lupito, and how the war has reached even the safety of their small community. Ultima again bridges divides in her friendship with Prudencio – he represents a very strong Catholic, Spanish-influenced tradition, but even Prudencio has been helped by the curandera. They work and cook and tell stories, and Antonio overhears his mother talking to her brother Juan about him. They hope he will choose the Luna way of life and come stay at El Puerto one summer soon, before he is "lost" like the other Márez brothers. It seems Antonio's older brothers chose the Márez way of life over the Lunas – Antonio is María's last hope, which is why she smothers him so heavily with her dreams. Antonio thinks about the brujas dancing with the devil across the river, but then he hears Ultima's owl and thinks of the Virgin and feels comforted. Adult Antonio (who is telling the story) steps back here with knowledge from later in the novel, creating a sudden ominous tone with the witches. Cosby, Matt. "Bless Me, Ultima Chapter 5 (Cinco)." LitCharts. LitCharts LLC, 20 Nov 2013. Web. 22 Apr 2019. Cosby, Matt. "Bless Me, Ultima Chapter 5 (Cinco)." LitCharts LLC, November 20, 2013. 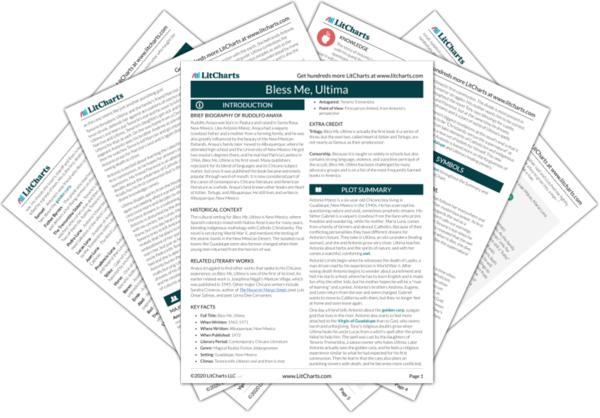 Retrieved April 22, 2019. https://www.litcharts.com/lit/bless-me-ultima/chapter-5-cinco.